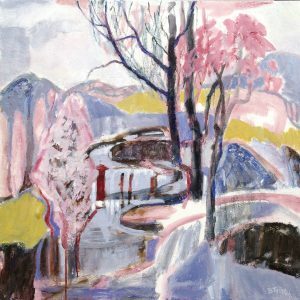 Beverley has a responsive and experiential approach to art which, together with her abstract expressionism, creates a collection of individually unique works. 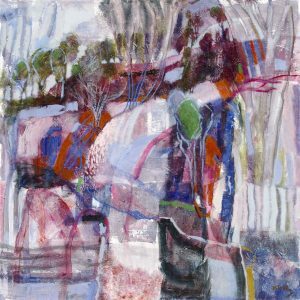 Her paintings are related as a whole, not only by their acrylic medium, but by a layered and highly developed sense of colour, form and line – the interwoven relationships of which have been mastered during her now forty years of brushwork. Beverley is constantly striving to portray experiences, concepts and feelings using line, form, colour and space relationships in contemporary and often abstract ways. She works mainly in acrylics on canvas. Initially she builds up mindscapes from her visual experiences and then allows the work to evolve on the canvas. Eventually, she reaches the creative point where the painting dictates what she should do next. Beverley loves to expose the underlying transparent layers in some areas, whilst covering them in others. More transparent glazing follows building layer upon layer. Her work continues to evolve in this manner until she feels the dialogue between colour, form and space has been resolved.